The bursts of flavor found in the sandwiches, burgers and soups at Boiler Bistro in Marriott Hall soon will come courtesy of local, sustainable ingredients. As early as next semester, the bistro will begin using herbs, tomatoes and lettuce grown at the Purdue Student Farm, located on five acres near McCormick Road and Indiana 26, says Ambarish Lulay. He is a clinical chef instructor in the School of Hospitality and Tourism Management and he is the bistro's supervisor. Lulay says the bistro is making moves to focus on sustainability because it's a responsible way to run the operation, and because sustainable practices are valuable lessons for the students who work there. "First and foremost, we're a teaching facility for HTM students, and sustainability is a piece that needs to be taught more and more," Lulay says. "Given the economic climate and many ongoing corporate initiatives, students are going to see a focus on sustainability in this industry, so it's important for them to learn about it now." Today, Purdue celebrates efforts to use and promote sustainable food as part of its annual Green Week celebration. For a full list of remaining Green Week events, go to www.purdue.edu/greenweek. In addition to looking for ways to include sustainable ingredients, the bistro is considering using sustainable utensils and dinnerware. One of Lulay's students is studying the most cost-effective way to implement such products, he says. While Boiler Bistro makes moves to become more sustainable, the John Purdue Room in Marriott Hall has been using local, sustainable ingredients in its lunch menu items since it opened in its new location in January, says Mick La Lopa, associate professor of hospitality and tourism management. He teaches the HTM 291 students who run the restaurant's lunch operations. 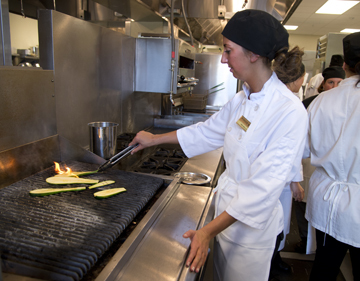 "Everything we do in terms of lunch service at the John Purdue Room focuses on four values -- we want our food to be healthy, locally produced, seasonal and sustainable, especially because we are part of the College of Health and Human Sciences," La Lopa says. Local, sustainable ingredients used in lunch menu items include eggs from Sheep Dog Farms, a cage-free facility about 12 miles northwest of campus; in the past, lunch menu items have used chicken from the farms. Other sustainable ingredients used are tomatoes, peppers and assorted vegetables grown at local farms or at the student farm. Beef, pork and lamb used in lunch menu dishes comes from Smith Hall's Boilermaker Butcher Block, a facility that sells meat raised at Purdue's animal sciences farm, which is located near Montmorenci. Additionally, HTM recently received a grant from Arni's restaurants, a local chain, to start an herb garden. The herbs grown will be used in dishes on the John Purdue Room's lunch menu and in the food at Boiler Bistro. In addition to using sustainable ingredients, the John Purdue Room sends its food waste to West Lafayette's wastewater treatment plant, where the city's digesters convert it into energy to power the plant. Nelly Farmer, sous chef at the John Purdue Room and a chef instructor, says the restaurant's focus on sustainability makes sense given the environmentalist bent of the campus and city. "Any time you're running a culinary operation, it make sense to focus on local, sustainable food, because local food that's in season is cheaper and tastes phenomenal," Farmer says. "When it comes to composting our food waste, we knew that West Lafayette was the second city in the country to get a digester, so we wanted to make sure to use it in any way we could." Eventually, the goal is to create the restaurant's entire lunch menu based around the local, sustainable ingredients available during each season. Lulay says the sustainability efforts of Boiler Bistro and the John Purdue Room bode well for Purdue as well as for the surrounding community. "Sustainability doesn't just mean buying ingredients locally," Lulay says. "It means using your dollars to support the right local farmers -- farmers whose operations are eco-friendly and responsible. When you do that, it's good for everyone involved." Writer: Amanda Hamon, 49-61325, ahamon@purdue.edu.